Prototype: French State Railways (SNCF) TGV Duplex V 150 (train à grande vitesse) high-speed train, in the version for service and composition as a 5-part powered rail car train for the world record run on April 3, 2007. 1 powered end car (TK2), 1 transition car (R8), 1 intermediate car (R4), 1 transition car (R1), 1 powered end car (TK1). Double anti-roll shock absorbers on the trucks, powered end car TK2 without a pantograph on the roof, altered cab windows, and a one-piece hood. Only powered end car TK1 equipped with a pantograph. Powered rail car train road number 4402. The train looks as it did in 2007. Model: Both end cars (TK1 and TK2) are powered. The train has an mfx+ digital decoder and extensive sound functions. It has controlled, high-efficiency propulsion with a flywheel in both powered end cars, centrally mounted. 4 axles powered through cardan shafts in each end car. Traction tires. The train has factory-installed interior lighting. The triple headlights and dual red marker lights change over with the direction of travel. They and the interior lighting will work in conventional operation and can be controlled digitally. The third headlight for the French headlight code can be turned off separately in digital operation (light function). Maintenance-free, warm white and red LEDs are used for the lighting. The cabs in the powered end cars have interior details. The train has separately applied metal grab irons. A powered end car and a transition car are permanently coupled together in pairs and have special close couplings with a guide mechanism. There is an additional guide mechanism in the Jakobs truck. The end cars have a pickup shoe changeover feature so that the pickup shoe at the front of the train is the one picking up power. The interior lighting is powered through a continuous electrical connection through the entire train. Powered end car TK2 prototypically has a pantograph removed. Only powered end car TK1 has a pantograph. The pantographs work mechanically but are not wired to take power. The train is a scale reproduction. The minimum radius for operation is therefore 360 mm / 14-3/16", when there is sufficient clearance on both sides. 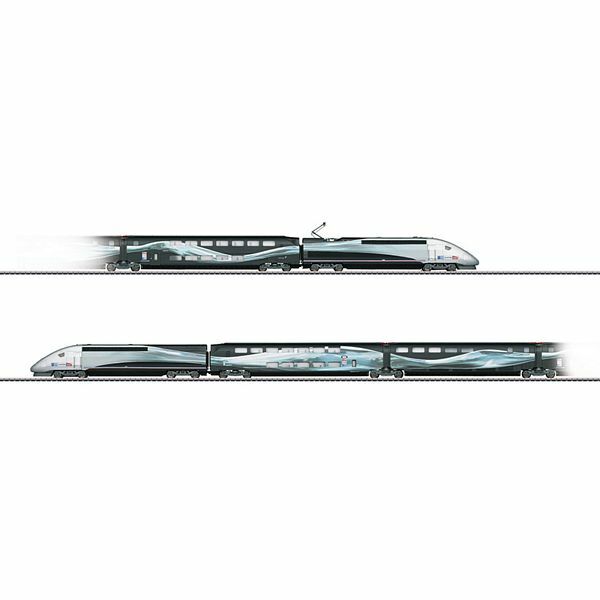 The TGV Duplex V 150 high-speed train comes with a consecutively numbered certificate of authenticity. Length of the 5-part powered rail car train approximately 125 cm / 49-1/4". One-time edition limited worldwide to 3,000 powered rail car trains. The French railroad SNCF purchased the "Train à Grande Vitesse Paris - Ostfrankreich Südwestdeutschland" (TGV POS) for high-speed service between Paris, Eastern France (Strasbourg), and Southern Germany. The core of the TGV POS was initially the new construction of the high-speed route to connect Strasbourg with Paris as well as the corresponding equipment for the trains for current and signal systems in Germany and Switzerland. The TGV POS was not really a generation of cars and powered units developed totally from scratch. The TGV POS was more a mix of new powered end cars and intermediate cars from the TGV Réseau. The new powered end cars were mechanically very similar to those of the TGV Thalys PBKA (Paris - Brussels - Cologne / Amsterdam). The electrical equipment for three current systems (1.5 kilovolts DC, 25 kilovolts / 50 Hertz, and 15 kilovolts / 16-2/3 Hertz) was being done for the first time using asynchronous technology with IGBT-controlled three-phase asynchronous motors. The intermediate cars came from the TGV Réseau. However, they were extensively modernized and brought up to the latest technical standard at the workshops in Bischheim. They therefore differed strikingly from the other generations of TGV trains. Nineteen units were purchased whereby road number TGV 4402 was something special. Its powered end cars were used for a world record attempt, because after the TGV records of February 26, 1981 (380 km/h /237.5 mph) and May 18, 1990 (515.3 km/h / 322 mph), the French still wanted to know: On Mach 26, 2007, SNCF and Alstom presented the future record train to the public with the designation "V 150" (= 150 meters/second / 487.5 feet/ second = 540 km/h / 337.5 mph). It consisted of the two powered end cars and three modified bi-level intermediate cars of the latest type. Corresponding adaptations this time were additional powered trucks under the intermediate cars to increase performance to 19,600 kilowatts / 26,273 horsepower as well as newly altered gearing and wheel diameter. The test route on the LGV Est line was given reinforced roadbed on the curves as well as increased catenary voltage from 25 kV to 31 kV. In the end, the "V 150" set a new, unbelievable world speed record for rail vehicles at midday on April 3, 2007 on the LGV Est line. In 13 minutes, the train accelerated to the absolute top speed of 574.8 km/h / 359.25 mph. This record run was broadcast live from several television channels. An airplane accompanied the silver-black bullet and hundreds of people cheered the train when it passed several bridges just 200 kilometers / 125 miles east of Paris at its maximum speed. This record run cost Alstom and SNCF 30 million Euros. The two powered end cars have kept their striking world record lettering in regular service, which immediately draws attention to the attempted speed.